We got a little FISHY on this card using Lawn Fawn Dad + Me stamp set and Dad + Me Lawn Cuts. This Dad + Me stamp set is the CUTEST and not just for Dad cards or Father’s day cards. Check out this fishy card we created. 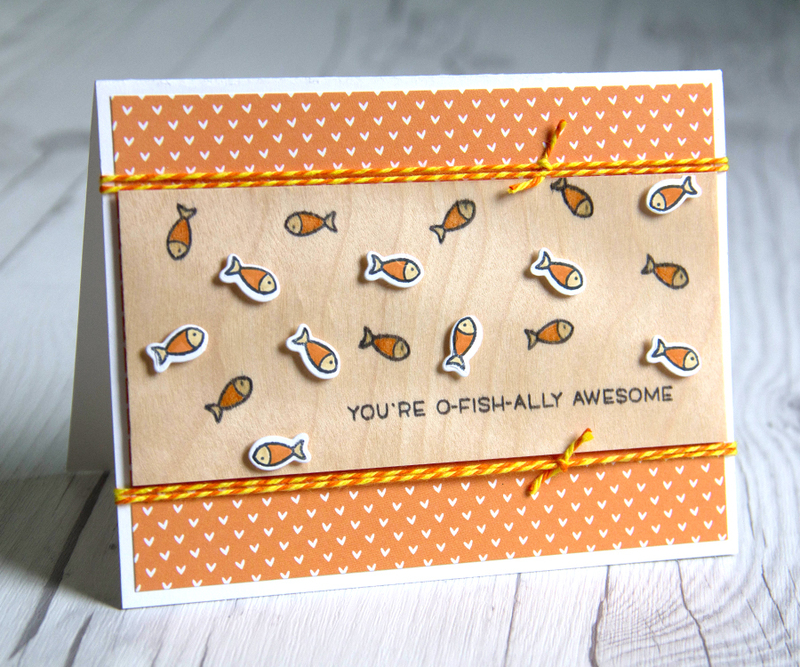 We absolutely LOVE how the darling fish look stamped on our Birch wood paper, just like little gold fish. We stamped a few more fish on white card stock and popped them on the card with a little foam tape for added dimension. O-FISH-ALLY cute! Supplies for Fishy card: Birch Wood Paper, Dad + Me stamp set, Dad + Me Lawn Cuts, Let’s Polka in the Dark Petite Paper Pack, white card stock, black ink, Copic Markers, baker’s twine, foam adhesive and adhesive. Thanks again for stopping by. Check out the Lawn Fawn blog for more great ideas using their products with our Wood paper! This entry was posted in Crafts & Kits, DIY Projects, Stationery & Envelopes and tagged birch, crafts, et cetera, Lawn Fawn.